Among some of Gian Lorenzo Bernini’s most popular works are his Roman fountains, including Fontana dei Quattro Fiumi. Gian Lorenzo Bernini (1598-1680) was a 17th century sculptor and architect who is credited with creating the Baroque style of sculpture. The emergence of the Counter-Reformation. The consolidation of absolute monarchies and the growing power of the middle class. A newfound interest in nature. Who is Gian Lorenzo Bernini? 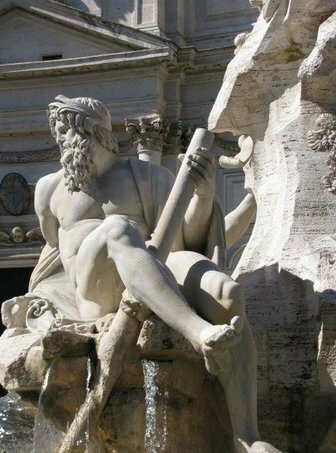 Among some of Bernini’s most popular works are his Roman fountains, including Fountain of the Triton, or Fontana del Tritone, and the Barberini Fountain of the Bees, the Fontana delle Api, and the Fontana dei Quattro Fiumi. Fountains like these served multiple purposes. The provided water for the people. They were monuments to papal patrons. They were public works designed to beautify the city. The Fontana dei Quattro Fiumi, in particular, is located in the Piazza Navona in Rome. Designed in 1651, the fountain was commissioned by Pope Innocent X.
L’Estasi di Santa Teresa (The Ecstasy of Saint Teresa) is a sculptural group designed and completed by Bernini in white marble. The sculptures, commissioned by Pope Innocent X in 1647, are an elevated aedicule (shrine) in the Cornaro Chapel, Santa Maria della Vittoria in Rome. Elephant and Obelisk is a sculpture designed by Benini and unveiled in the Piazza della Minerva in Rome in 1667. The sculpture was commissioned by Pope Alexander VII, who decided he wanted an Egyptian-style obelisk in front of the church of Santa Maria sopra Minerva. The sculpture itself, while designed by Bernini, was actually executed by his student, Ercole Ferrata. AESU offers several trips to Rome, Italy: Viva Italia, Cosmopolitan, Explorer, Euro Focus, Great Escape, and Euro Spree. This entry was posted on Thursday, June 18th, 2015	at 3:09 pm	. You can follow any responses to this entry through the RSS 2.0	feed. Both comments and pings are currently closed.